The story of Rip Van Winkle, told by Irving, dramatized by Boucicault, acted by Jefferson, pictured by Darley, set to music by Bristow, is one of the best known of American legends. Rip was a real personage, and the Van Winkles were a considerable family in their day. 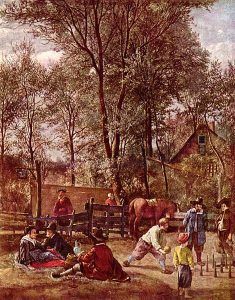 An idle, good-natured, happy-go-lucky fellow, he lived, presumably, in the village of Catskill, New York and began his long sleep in 1769. 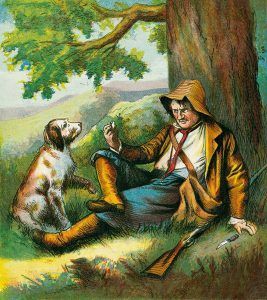 His wife was a shrew, and to escape her abuse Rip often took his dog and gun and roamed away to the Catskills, nine miles westward, where he lounged or hunted, as the humor seized him. It was on a September evening, during a jaunt on South Mountain, that he met a stubby, silent man, of goodly girth, his round head topped with a steeple hat, the skirts of his belted coat and flaps of his petticoat trousers meeting at the tops of heavy boots, and the face—ugh!—green and ghastly, with unmoving eyes that glimmered in the twilight like phosphorus. The dwarf carried a keg, and on receiving an intimation, in a sign, that he would like Rip to relieve him of it, that cheerful vagabond shouldered it and marched on up the mountain. At nightfall they emerged on a little plateau where a score of men in the garb of long ago, with faces like that of Rip’s guide, and equally still and speechless, were playing bowls with great solemnity, the balls sometimes rolling over the plateau’s edge and rumbling down the rocks with a boom like thunder. A cloaked and snowy-bearded figure, watching aloof, turned like the others, and gazed uncomfortably at the visitor who now came blundering in among them. Rip was at first for making off, but the sinister glare in the circle of eyes took the run out of his legs, and he was not displeased when they signed to him to tap the keg and join in a draught of the ripest schnapps that ever he had tasted,—and he knew the flavor of every brand in Catskill. 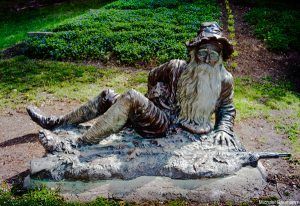 While these strange men grew no more genial with passing of the flagons, Rip was pervaded by a satisfying glow; then, overcome by sleepiness and resting his head on a stone, he stretched his tired legs out and fell to dreaming. Morning. Sunlight and leaf shadow were dappled over the earth when he awoke, and rising stiffly from his bed, with compunctions in his bones, he reached for his gun. The already venerable implement was so far gone with rot and rust that it fell to pieces in his hand, and looking down at the fragments of it, he saw that his clothes were dropping from his body in rags and mold, while a white beard flowed over his breast. Puzzled and alarmed, shaking his head ruefully as he recalled the carouse of the silent, he hobbled down the mountain as fast as he might for the grip of the rheumatism on his knees and elbows, and entered his native village. What! Was this Catskill? Was this the place that he left yesterday? Had all these houses sprung up overnight, and these streets been pushed across the meadows in a day? The people, too: where were his friends? 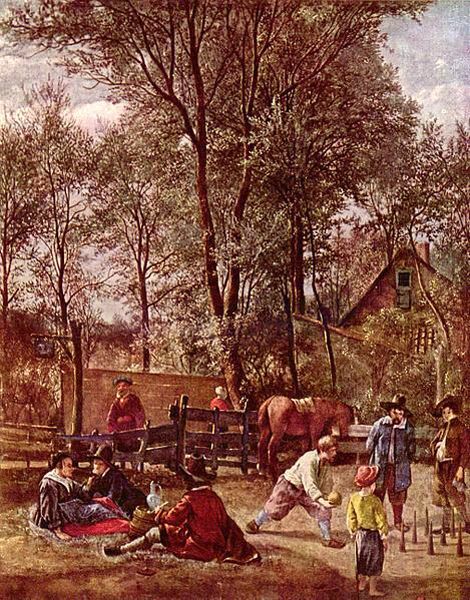 The children who had romped with him, the rotund topers whom he had left cooling their hot noses in pewter pots at the tavern door, the dogs that used to bark a welcome, recognizing in him a kindred spirit of vagrancy: where were they? And his wife, whose athletic arm and agile tongue had half disposed him to linger in the mountains how happened it that she was not awaiting him at the gate? But gate there was none in the familiar place: an unfenced yard of weeds and ruined foundation wall were there. Rip’s home was gone. The idlers jeered at his bent, lean form, his snarl of beard and hair, his disreputable dress, his look of grieved astonishment. He stopped, instinctively, at the tavern, for he knew that place in spite of its new sign: an officer in blue regimentals and a cocked hat replacing the crimson George III of his recollection, and labeled “General Washington.” There was a quick gathering of ne’er-do-wells, of tavern-haunters and gaping ‘prentices, about him, and though their faces were strange and their manners rude, he made bold to ask if they knew such and such of his friends. 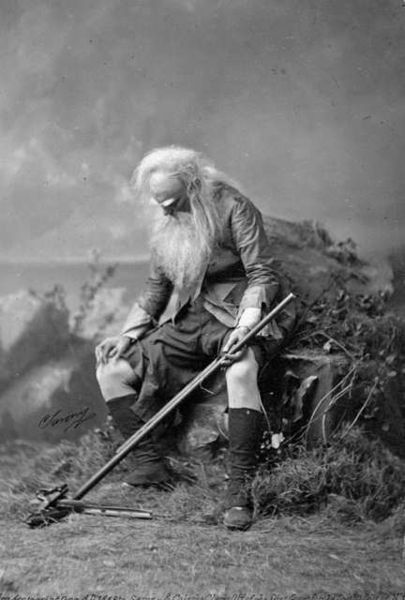 Joseph Jefferson played Rip Van Winkle in theatrical productions and short films in the late 1890’s. And to Rip’s utter confusion he saw before him a counterpart of himself, as young, lazy, ragged, and easy-natured as he remembered himself to be, yesterday—or, was it yesterday? Twenty years ago! Truly, it was so. Rip had slept for twenty years without awaking. He had left a peaceful colonial village; he returned to a bustling republican town. How he eventually found, among the oldest inhabitants, some who admitted that they knew him; how he found a comfortable home with his married daughter and the son who took after him so kindly; how he recovered from the effect of the tidings that his wife had died of apoplexy, in a quarrel; how he resumed his seat at the tavern tap and smoked long pipes and told long yarns for the rest of his days, were matters of record up to the beginning of this century. 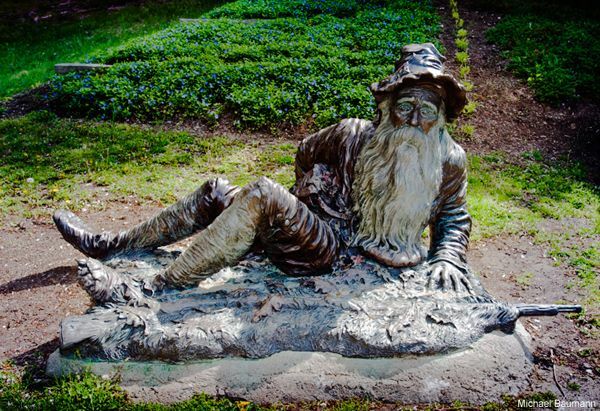 Statue of Rip van Winkle in Irvington, New York, not far from “Sunnyside”, the home of Washington Irving, photo courtesy The Rivertowns, New York. And a strange story Rip had to tell, for he had served as cup-bearer to the dead crew of the Half Moon. He had quaffed a cup of Hollands with no other than Henry Hudson himself. Some say that Hudson’s spirit has made its home amid these hills, that it may look into the lovely valley that he discovered; but, others hold that every twenty years he and his men assemble for a revel in the mountains that so charmed them when first seen swelling against the western heavens, and the liquor they drink on this night has the bane of throwing any mortal who lips it into a slumber whence nothing can arouse him until the day dawns when the crew shall meet again. As you climb the east front of the mountains by the old carriage road, you pass, half-way up the height, the stone that Rip Van Winkle slept on, and may see that it is slightly hollowed by his form. The ghostly revelers are due in the Catskills in 1909, and let all tourists who are among the mountains in September of that year beware of accepting liquor from strangers. Irving’s tale spawned theatrical productions, songs, children’s books, short films, and this tale by Charles M. Skinner written in 1896. About the Author: Charles M. Skinner (1852-1907) authored the complete nine volume set of Myths and Legends of Our Own Land in 1896. This tale is excerpted from these excellent works, though it is no verbatim, as it has been edited for the modern reader.